Jules, the Duke of Dandridge is trying to avoid all the predatory mama and their daughters. A short while ago none of them would gave even glanced at him. They are all only interested in his title. Some are much more persistent then others. Miss Jemmah Dament is a bit of a Cinderella type character. Her mother and older sister bully her and treat her no better than a servant. When someone offers her a way out she jumps at it. A short and sweet love story with interesting characters, but no great surprises. An enjoyable light read. Exquisitely written and genuinely charming! Jules, Duke of Dandridge, had to drag himself to attend his godmother’s birthday ball, and he tried to make a hasty exit, because of all the marriage-minded mamas that follow his every step, such as Mrs. Dament and the gorgeous Adelina. But it’s Adelina’s sister, Jemmah and Jules’ childhood friend, whom he hopes to see. It’s been too long, two years, and luck has it at that birthday ball, when Jules happens to enter a room and finds Jemmah who had been napping. Jules rarely goes out, and Jemmah even less so. She has been forever in the shadow of her beautiful older sister Adelina; Jemmah is the forgotten daughter, the one always neglected in favour of the golden child, Adelina who as gloriously beautiful as she is, has an ugly soul and a mean mouth: Adelina is her mother’s daughter. Jemmah wears hand-me-downs from the beautiful one, and her life recalls Cinderella’s in small ways. Jemmah has always had a crush on Jules, but as her mother and Adelina had their eyes on the duchy, Jemmah stayed in the background, as always. What she didn’t know is that Jules had always liked her a lot, and now he sees the beautiful and caring woman she has become, and even though he hadn’t thought of marrying for a good while yet, reconnecting with Jemmah just changed Jules’ mind. Jules of the sombre mien and serious demeanour comes alive once again when he gets to see his friend Jemmah; he knows what it is to be to be neglected, to be left in the shadow of another sibling. Jules also knows what it is to have his love taken away, and he had the misfortune that the woman he thought he would marry turned out to be otherwise than she appeared; she was not unlike the horrid Adelina. He knows Jemmah, and she is even lovelier inside than she is outside. Jemmah is little more than a servant to her mother and older sister, and the reason behind Jemmah’s mother acting the way she does, is understandable and logical in her own mind, albeit still unforgiveable; Jemma’s mother is not nasty or storyline purposes, in her twisted way, she’s acting as she should. 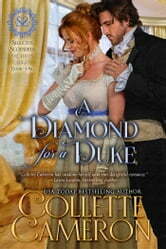 I love the fairytale on which A DIAMOND FOR A DUKE is based, a French classic by Jean Perreault, because it is about looking beyond appearances, that all that glitters is definitely not gold, and what a joy to have Collette Cameron give it an lovely Regency twist. The writing is brilliant, so colourful and eloquent, and I love how Ms. Cameron again comes up with original and often quite hilarious epithets and exclamations. The characters feel genuine, and I absolutely adored Jemmah’s Aunt Theo! I could picture her in every little detail, so formidable and decisive, and fair. The romance between Jules and Jemmah is simply a lovely person; they truly like each other, nothing is rushed; it’s just a progression of how they felt towards each other since they were children, and since neither got out much, they just didn’t see each other all that much for a long time. Jemmah thought she was undeserving of someone like Jules, a duke no less, she of the tattered clothes and what she thought were her plain features. She is charming, and Jules is a wonderful man: honourable, kind, and so protective of his friend and of his true love, Jemmah. A DIAMOND FOR A DUKE might be short in length, but it is long on charm, the writing is exquisite as ever, which is not surprising from Collette Cameron. A DIAMOND FOR A DUKE is a wonderful read that will take you away for a bit and have you dreaming of finding your own Jules and a romance as true as Jules’ and Jemmah’s. I wonder if we will get to see Sutcliffe’s and Pennington’s stories… I voluntarily reviewed an advanced reader copy of this book. Collette Cameron offers a lovely rendering of an old fairy tale, Diamonds and Toads. One I had admittedly never heard of until reading A DIAMOND FOR A DUKE. It's a sweet, romantic story of true love between childhood friends, but also a story of two sisters who couldn't be more different in character or looks. The eldest, Adelinda, is favored by their mother for her good looks which are very much like her own as is her cruel and selfish behavior. The younger sister, Jemmah, favors their father, both in her kind temperament and her appearance. After his death, she is treated near the same as a servant until a benevolent family member takes her under their wing. Soon the true diamond between the sisters emerges. Jules, the Duke of Dandridge, unexpectedly meets Jemmah after years apart from his childhood friend. The reacquaintance stirs in him the fondness he always had for her making him determined to make her his Duchess. This novella is very much a sweet fairytale with a lovely fairytale ending that made me sigh. 4 stars ~Complimentary copy received. All opinions expressed in this review are my own. Another satisfying read from you Colette. Love the Regency setting and the family orientated story.